When I was young (er), what I wore was incredibly important to me. I saw my body as an extension of my creative self. I had a mohawk, dyed with bright henna and always had three black dots on the side of my face. I don’t know why, they just felt authentic. My clothes were baggy, military or black and red. British punk and new wave was my scene and I proudly wore all the pins from the concerts I had attended. I even pierced my nose, long before it was fashionable. A steel ring, some pliers and viola! I did the same to my ears, many times and still sport the “stick and poke” tattoos. I was PUNK! Like any good punk, Doc Martens were the boot of choice and, at one time, I had at least 10 pairs. They hurt my feet, a lot, so the obvious second choice was America’s answer to punk footwear, Chucks. I saw these shoes today on the Bloomingdales website, ironically while I was trying to find the value of my last pair of Chucks so I could sell them. I would have killed for these, plain and simple. Chuck Taylor Converse high-tops were shoes of the gods! In the 80’s it was rare and expensive to find any that weren’t just a solid color. Kids in the know would only accept black or very specific colors. Wear white and we would truly pity you. Later, as the nineties encroached, painting your Chucks became very common. Previously, a sharpie, boredom and s few choice words might enhance their look but now we were cracking out the acrylics and going to town! A little piece of my soul needs these shoes!!!!! Now that I can afford them, my feet cannot. So, here I am, on my blog, letting my inner child scream for a bit. Aren’t we all pieces of who we were? Who are you and how do you express yourself in your daily life? I can’t answer this very well today. I need to find ME again. Author Gillian C Bruce -Tangible ImaginingsPosted on January 31, 2019 Categories UncategorizedLeave a comment on Who Are You? I know that I have said this before, but this time I mean it! 2019 will be a year of transition for me. A number of things transpired in 2018 that have drastically altered the landscape of both my business and personal lives. My health and the health of my adult children have taken the front seat on this journey around the sun. My time is split between being a caregiver and finding unique ways to make money; mostly by selling what we don’t need. In between, there is art. There will ALWAYS be art. Just like the dots on this apple, life is made up of uncountable moments. What we do in those moments will shape who we are and how we impact others. Being conscious of your actions and thoughts will help you reach your goal, even if you are not exactly sure what that looks like. Every dot, every moment, every connection, every person, is required to make the idea a reality; a “Tangible Imagining” if you will. My daughters and I are facing a somewhat difficult and unknown future. But, as it is with all things, if we focus on what we want from life and we execute each moment with care, eventually, it will become a reality. I draw with dots because I cannot draw lines well anymore. We adapt, if we want to. Here’s to a new year. I hope you can adapt and keep your eye on the goal! Author Gillian C Bruce -Tangible ImaginingsPosted on January 30, 2019 Categories UncategorizedLeave a comment on Welcome to the New Year, AGAIN. I promised my two youngest nieces that I would make each of them a new sweater for Christmas. That, of course never happened. So, instead, They each got a hat and an IOU. Now I am frantically trying to get two sweaters done before the intended recipients outgrow them or summer arrives. The problem is, that I make everything without a pattern, so my ideas have a way of growing and growing to the point where I feel like I have bitten off more than I can chew, sometimes. Here is the youngest niece’s sweater…. The only problem is that it STILL isn’t finished. After this photo, I decided to add an under layer of yellow to the bottom hem and the when I had it all washed and pressed, I realized that I had moved the hem a full 2 inches off on one side. My husband said to send it any way but I can’t….so…….snip….snip…….sigh. I joined one of those “100 drawings in 100 days” groups on Facebook. It was not until after I joined that I realized that most of the assignments were a bit juvenile and not something I would waste my time drawing. “Draw your favorite Pokemon” comes to mind…..I also was soon to discover that other than the moderator, I was the only other artist who took the bait. No thank you. I am, however, going ahead with the idea and using the list I was given as a template. So, drum foll please, the first assignment was to draw yourself….oh hell….no one like this one, but I guess it is best to get it over with. Here ya go. It got cropped kinda funny. I had to upload it from my phone to Facebook and then to my Chromebook, so you get what you get. The next drawing will be of my favorite animal!!! Clean up and New Postings. Happy New Year!!! Now that my shop is “up and running”, it is time to start clearing out old inventory and posting the new things that I am working on. Many of my older pieces will inevitably be scrapped as my skill level keeps improving and the materials I chose are of better quality. Some, like this bracelet, however, will be added to my shop and priced for what I hope is a quick sale. I have been working hard on solving some of the engineering issues for hanging raw crystals from used bullet casings. I had an “ah-ha!” moment the other day and now am buzzing right along. Those will be posted at a later date. In the meantime, I am trying to create birthstone chain necklaces for each month of the year. So far, I have garnet for January complete and in the shop. Amethyst is almost finished as well. This really is THE year that I hope to get this albatross up and flying, even if we don’t manage a great deal of altitude. Stay tuned!! Author Gillian C Bruce -Tangible ImaginingsPosted on January 19, 2016 Categories UncategorizedLeave a comment on Clean up and New Postings. It is finally here. 2016 is the year that I crank everything into high gear and make my shop what I have always wanted it to be; successful! I have set up my jewelry studio and am hard at work creating new pieces that will be posted to my Etsy shop at the beginning of the new year. I have made several new pieces that have been given as gifts this Christmas, just to make sure I am “up to snuff”. It is amazing how quickly your hands loose the dexterity needed to work with such tiny pieces, but it is equally amazing how quickly you can regain the skills. This turquoise and fire agate necklace is for a friend of mine who is going through a divorce. Her birthday is in December (turquoise) and she said she was oddly drawn to orange recently, so what better than a fire agate! Thus far, most of my work is simply compiling things from around my shop. I am not doing a lot of fabrication…..yet. Copper and natural blue agate. I enjoy working with complimentary colors like blue and orange but hope to get to some contrasting combinations like blue and yellow. I have not been posting much content recently for a number of reasons, not the least of which being that I currently do not have a studio. We moved out to central Oregon permanently at the beginning of 2015. It took us several months to finally get my entire shop and my husbands wood shop packed up and moved. In fact, there are still odds and ends needing to be collected from our old house, which is going on the market this week. In the meantime, I have been making do on our big front porch, piled up in yarn on our sofa and using an old card table in the laundry room as a place for the messier affairs. Most of my supplies are tucked up in an attic over our garage and I spend far too much time up there contorting myself to see what might be in a tote or digging through various boxes. It is not an ideal way to feed the creative monster and in fact, my productivity at least jewelry wise has all but screeched to a halt. We do not have the funds to build a full studio yet and with winter fast approaching in a very cold climate, we have simply run out of time to set a foundation this year. So, my husband is enclosing our back porch to give me a space that is out of the house but still small enough to heat economically. The full studio will have a wood stove when it is built. 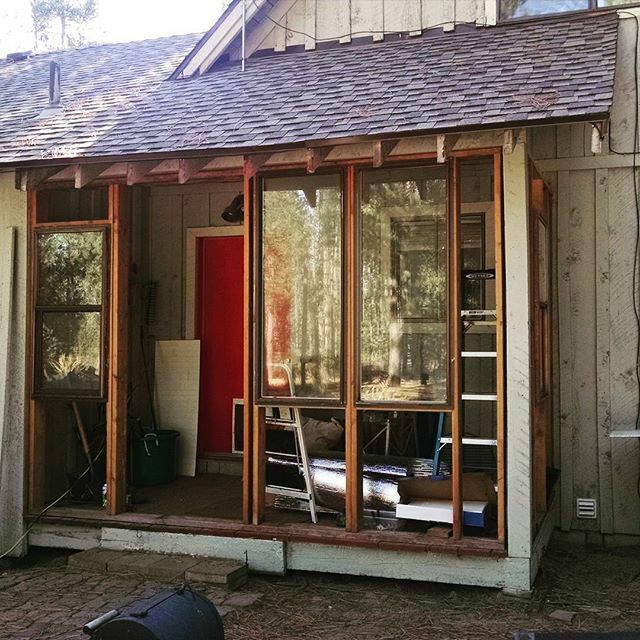 This porch has a window that we can open to let the house heat (also wood stove) in….or is it out? Worst case scenario, we have a small electric heater for additional “oomph”.